Get the scoop on turning your photos into unique and sellable pieces of art in this super creative yet practical session. You'll learn how to apply creative color to your images to produce black-and-whites, partial color effects, and color overlays. Don't miss this hands-on webcast presented by Lesa Snider. 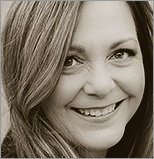 Lesa Snider is on a mission to teach the world to create—and use!—better graphics. She's a best-selling author, internationally acclaimed speaker, stock photographer and creator of the tutorial site, PhotoLesa.com. She's also a founding instructor for creativeLIVE.com (www.lesa.in/clvideos), coauthor of iPhoto '11: The Missing Manual, and a long-time member of the Photoshop World Dream Team of instructors. Lesa writes a regular column for Photoshop User, Photographic Elements Techniques, and Macworld magazines, and contributes frequently to Design-Tools.com and PlanetPhotoshop.com. You can connect with her on Facebook (www.facebook.com/PhotoLesa), YouTube (www.lesa.in/ytvideochannel), Twitter (@PhotoLesa), and www.PhotoLesa.com.